After two rounds of competition on tarmac for the Isle of Wight Car Club, it was time to head off road at the Knighton Sandpit for the first unsealed surface event of the year. In a stark contrast to the first two rounds, the weather was sunny and hot, with only the slightest breeze troubling the drivers. The course itself was an interesting mix of flowing sections, sand and tight corners. In the early runs, it seemed that the drivers were driving with a hint of caution, clearing the track and re-adjusting to the world of off-road driving after the tarmac rounds beforehand. 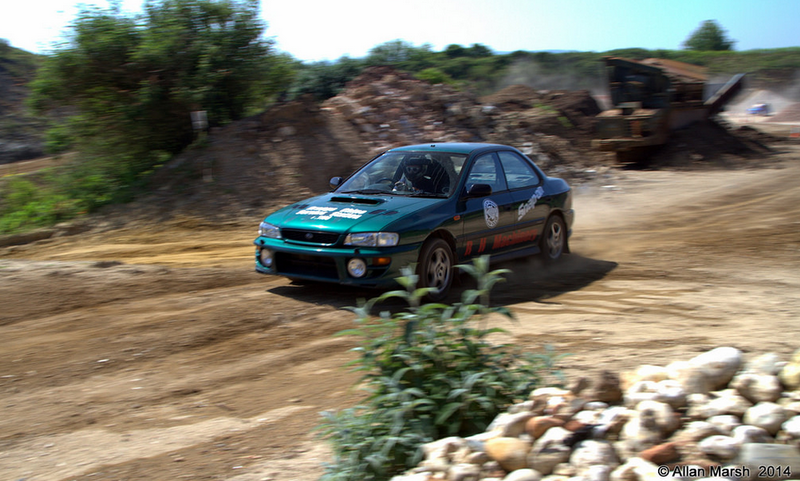 The Subaru Imprezas seemed to have the early edge, with the likes of Toby Allen and James Robbins setting the pace during the initial attempts. The track got quicker as the day went on despite ruts developing at the back of the course. This made the back section of the course a problem for the drivers, since it was much easier to lose time instead of gain time. Toby Allen was consistently fast throughout the day, and when the time sheets were printed at the end of the day, it was him on top overall, as well as class four, in the Subaru Impreza. He did not go unchallenged however, with the top five drivers all within two and a half seconds of him. This included Ryan Munt, Dan Morgan (The only person to drive anything other than a Subaru in the top six) and James Robbins, who made up the rest of the top four. Dean Long was on top in Class Two, using his flamboyant style to full effect in his Mazda MX5. Class Three honours went to Mini driver Steve Brett, while Steve Glass triumphed in Class One. Many thanks to Adam Weller for the write up and Allan Marsh for the Photography.